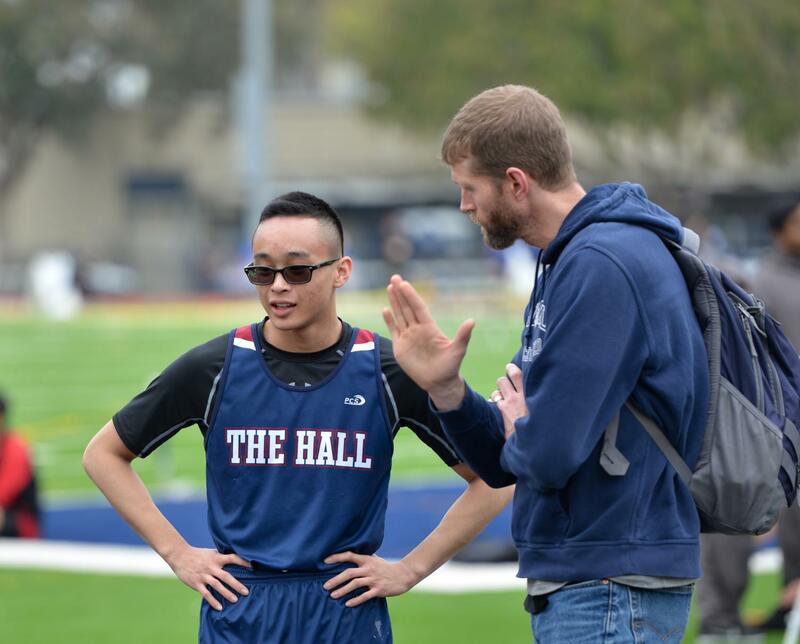 Head Coach Michael Buckley intructs sprinter and jumper Nick Ong ’19 during the King's Academy Invitational track and field meet earlier this month. Ong has emerged as one of The Hall's top athletes in his third year on the team and looks poised to be a contributor this year and next. With three section championships, two consecutive conference championships and five league titles all coming in the last six years, track and field is set to have another successful season, with many of the athletes returning. “We didn’t lose that many seniors, so I’m not concerned about that,” said head coach Michael Buckley. The team agrees they have what it takes to do well again this year. “Hard work, determination, and the will to do well all make the team successful,” Phoenix Aquino-Thomas ’18 said. The team’s past success is mainly attributed to the athletes’ perseverance and dedication to advance to the postseason. “I think we have a lot of talented guys on the track team, and all of us are always looking to improve,” 800-meter runner Skyler Dela Cruz ’19 said. Many of the athletes have been preparing in the off-season with Buckley after school. The distance runners are down in the weight room two to three times a week, lifting weights and doing cardiovascular exercises. High school track and field consists of 15 events. Convent & Stuart Hall participates in distance running, sprints, hurdles, relays and five field events. The team’s first meet was the Sunset Invitational at Kezar Stadium in early March, and the season ends with the CIF Championships in June.